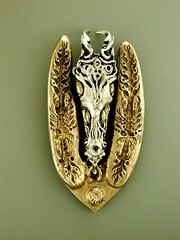 This pendant is an experiment in bi-metal casting with bronze and silver. This pendant has separate pieces which can be rearranged to suit the wearer�s mood. The shape and symbols on the main central pendant are meant to represent a loose interpretation of trees being earth, mother earth, feminine and fertile. The crow head at the top is the upward flight of growth and the little newt symbol at the bottom is the connection to the ground, inside, soil, rooted. The central relief image was made with a bisque fired clay stamp that was carved and modeled with a variety of small tools and the smaller vine leaf motifs on the upper sides were based an ancient Celtic design. This very lively piece changes colour when the light hits it at different angles which occurs often as it dangles on three jump rings. Using an assortment of my favorite handmade clay stamps these pendants are original, unique and one of a kind. These amulets are striking, spellbinding and provoke the primitive cabalistic and inherent spirituality within us all. They are a blend of both organic fossil-like images, symbols and cryptic designs with archaic forgotten glyphs all woven in various layers and patterns both familiar and chaotic. They are all stained in earth tones and high fired. The chord is waxed cotton. I sculpted three different sizes of crow�s heads which have hematite or garnet beads for eyes. Some are 18K gold and have diamonds set in the forehead. 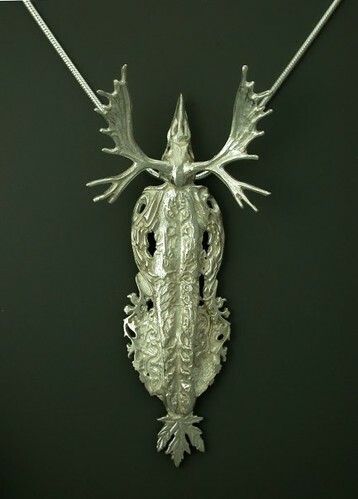 This pendant is a result of trying out different techniques with various waxes and images and assembling them into this design. It features moose antlers, a crow head and a maple leaf.